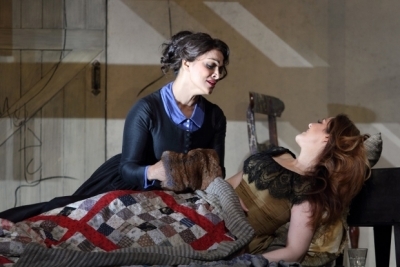 The Royal Opera’s new Bohème divided opinion when it landed last year. I thought it was rather good – I still do – but online it garnered more opprobrium than The Last Jedi. Detractors took exception to its inconsistent look, its comic coarseness and its impractical garret set, but they chose not to see the superb detail in Richard Jones’ direction. Eye contact and physical proxemics are meticulously considered and have an impact that I found devastating in this first revival, a double-cast affair whose first cohort (the company under review here) has been overseen by Jones himself. My opinion of its qualities remains unchanged since last September’s review. It’s La bohème for the ages: safe and traditional, brimming with snow, its three outer acts staged with stripped-back restraint and the spectacular second one evidently financed by the magic money tree. But I do agree about that garret, even though someone’s been round to fix the skylight since our last visit. Given that designer Stewart Laing plainly has realism in his sights it’s valid to ask where four burly and (one presumes) unwashed men doss down in their sealed attic. Imagine the stench. Are there beds beyond the fourth wall? If so why don’t they lend one to the dying Mimì? And – one for lighting designer Mimi Jordan Sherin, this – how can a room with almost no windows be so darned bright? Enough carping at detail; let’s celebrate the performances, which in some respects exceed the originals. The great American tenor Matthew Polenzani treads British boards all too rarely but his gilt-edged voice and artistry place Rodolfo unequivocally centre stage. His inamorata this time is Maria Agresta, an Italian soprano who is fast becoming a Covent Garden favourite. She was perhaps too glamorous in Puccini’s snowbound third act – more cool than frozen – but she sang throughout with passion and vulnerability, and that’s good enough for me. A healthy-looking trio of Parisian starvers join Polenzani in their flat-share. Duncan Rock and Fernando Radó shone as Schaunard and Colline, but it was Étienne Dupuis’ insouciant and superbly sung Marcello, all Parisian ‘bof’ and tetchiness, who proved to be the ideal foil for his colleague in the third act’s double love scene. For my money that snowbound moment is Puccini’s greatest half-hour, and conductor Nicola Luisotti, invariably pitch-perfect in his choice of tempo and dynamics, squeezed every drop of drama from it. For many, the show’s USP will be the casting of Danielle de Niese. The duchesse de Glyndebourne is a rare visitor to the nation’s capital stage but Musetta is a role that could have been written for her. She ate up the requisite coquettishness, sexiness and shrewishness in a performance of pure showbiz. Other singers may portray Puccini’s minx with greater refinement, but the character can rarely have crossed the footlights more seductively than she does here, the Dani way. Previous LinkPuccini’s La bohème at The Royal Opera HouseNext Link“Unsung Heroines” presented by Danielle de Niese, BBC4 8.00 pm June 22, 2018 and on BBC iplayer for 30 days.